Product placement is a classic (well, super 1980s) way to get funding for your film. It’s similar to the public broadcasting practice of underwriting, but is more commercial and less regulated. Sometimes product placement works, and you barely noticed the brand names strategically placed in a movie frame. Other times, product placement is so obvious it distracts from the movie itself. 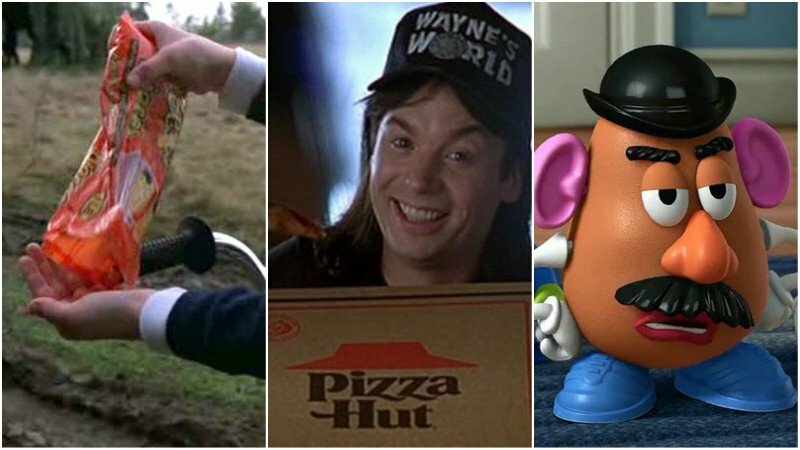 We’ve examined some of the worst cases of product placement in film history. Though it’s certainly a classic, the quirky ’80s Back To the Future franchise appeared to be funded by a variety of companies. Remember the Mountain Dew hat? We certainly do. Also, references to brands like Pepsi, Pizza Hut, Nike, and 7-Eleven appear throughout the series. Product placement was even more prominent in the second film. Thanks to a cast of characters that are already lucrative products in and of themselves, Toy Story was product placement’s dream film. Mr. Potato Head sales increased by 400% after its 1995 release date. Etch-A-Sketches also became wildly popular. This might not have been intentional, but it still worked, and it’s certainly forgivable given how acclaimed the film is. On a more high-end film note, Baz Luhrmann’s 2013 adaptation of The Great Gatsby featured Jazz Age cocktail dresses by Prada and Miu Miu. Tiffany and Co. made the 1920s-inspired jewelry. Brooks Brothers provided the suits. This made sense most of the time, as some of these luxury brands existed in that era and were popular among elite New York Society types of the era. Others were years away from coming to market and really didn’t belong in the film. Though not completely saturated with product placement, the 1982 film E.T. did make Reese’s Pieces much more popular. Profits increased by 65% mere weeks after the movie’s release. Interestingly enough, the movie makers had planned to use M&Ms but Mars refused to let them. On a much more subtle note, a variety of branded tech products appear in the background of many scenes, though few people notice them. The Transformers series exists to sell toys, but apparently that wasn’t enough for the filmmakers. They also felt the need to advertise a variety of other brands, from fancy cars to moving companies, beer brands to soda. Director Micheal Bay sure does like advertising. Or money. It’s probably the latter. All those explosions cost a lot. The Emoji Movie tried to be a modern, iPhone-era version of Toy Story, but it really didn’t work, thanks to the weak plot and shallow, stereotypical characters. Critics and audiences alike hated it; Metacritic gave the 2017 movie a 12 out of 100 metascore while IMDb reviewers gave it 3.2 out of 10. Not even Patrick Stewart could save this nonsensical, plot-less, pointless film. The 2009 Star Trek film takes place in the distant year 2241, yet Nokia still exists. The tech company survived WWIII and even kept its ringtone the same, which makes very little sense. There’s also a Corvette owned by James T. Kirk’s stepfather. It’s more than slightly ridiculous. These things really don’t belong in the 23rd Century, do they? I, Robot is another ad-filled futuristic flick. The 2004 film prominently features a futuristic Audi. At least the filmmakers made the car look like something out of a sci-fi movie. The ubiquitous presence of Converse sneakers? That’s a little harder to buy. Perhaps that’s (partly) why the movie got a mediocre Metacritic metascore rating of 59. Here’s an interesting case. Wayne’s World mocked shameless product placement of brands like Pizza Hut and Dorito’s but it also gave Queen’s music a serious boost. The band’s rock opera tune “Bohemian Rhapsody” hit the No. 2 spot on the U.S. charts. That’s a big deal for a band that hadn’t really been too big this side of the pond. The post 10 Movies With Excessive Product Placement appeared first on ComingSoon.net.